The audio above was recorded by Diana Walker, CEO, Diana's Healthy Lifestyles, with guest Trudy Stoelting Sunrider Calli Tea favorite herbal beverage with Stevia. Trudy and Diana both have enjoyed Sunrider Stevia daily for over 15 years now. Sunrider Fortune Delight with Stevia and Sunrider Calli Tea, hot or cold, are favorite drinks for health-minded people everywhere! Most people suffer with cravings for sweets. Do you notice that when you have some sugar, you crave more? I've known people who were able to give up alcohol, but became even more addicted to smoking, or coffee (with lots of sugar), or lots of sweets - donuts, candies, etc. The problem with sugar is that too much sugar (or any simple carbohydrate), creates insulin rushes that overwork the insulin receptors in the body. As time goes by the body cannot handle all the sugars (and even some grain carbohydrates). The body begins to weaken. White bread is a simple sugar. White rice is a simple sugar. White sugar is a simple sugar. Soft drinks are simple sugars. Even fruit juices are simple sugars. Each of these spikes your blood sugar high, and then drops it down low. This is very hard on the body, on the adrenal glands, and the pancreas. Artificial sweeteners can have even more devastating effects than white sugar. STEVIA HEALTH BENEFITS Click Here to Order Stevia (Diana Walker will be your Nutrition Coach and provide free samples to new Customers of Sunrider Fortune Delight and Sunrider Calli Tea. There are nearly 300 species of the Stevia family scattered all over the world. Of these, only one…Stevia Rebaudiana…contains the secret of steviosides, which make it the sweetest herb in the world. Stevia Rebaudiana is a small shrub native to China and to portions of Paraguay and Brazil. It is now being cultivated in many countries. The best grade Stevia is that from Paraguay. The Stevia herb in its natural form is approximately 20 to 30 times sweeter than common table sugar. Extracts of Stevia in the form of Steviosides can range anywhere from 100 to 300 times sweeter than table sugar. And best of all, Stevia gives you a feeling of even energy, rather than the ups and downs created with white sugar. Stevia has historically been used as a safe sweetener, a medicine (as it has antibacterial agents), a cosmetic ingredient, and as a dentifrice (in toothpastes) as it inhibits the development of plaque and cavities. In Brazil it is advertised as an anti-diabetic agent. The Japanese tested stevia extract and found it without health risk. They incorporate it in numerous food products, including candies, ice cream, pickles, and soft drinks. In 1988, refined stevia extract was used in 41% of Japan’s multi-million-dollar market for high-intensity sweeteners. The FDA in the United States has approved the usage of Stevia, not as a sweetener, but as a dietary supplement that helps balance blood sugar and blood pressure! There are virtually no calories in Stevia. You can bake with Stevia since the extracts are heat stable. There are many forms and extracts of Stevia. One must be careful to buy the best quality to ensure it has enough active ingredients. 2. White powder (just looking at it, you know it has been processed, just like white sugar). Sunrider has led the Herbal Health Food Industry with owner expertise and state-of-the-art manufacturing for over 25 years. Our Sunrider whole foods and products are not only decades ahead of the competition, but the quality and innovation of our products remain unsurpassed because of our exclusive formulation and trade-secret manufacturing process. For example, in 1984, Sunrider was one of the companies to introduce stevia to the market with the launch of Sunectar. Stevia, a naturally sweet herb, helps maintain blood sugar levels and is a wonderful supplement to food and beverages to help maintain a healthy lifestyle. The stevia used in our Sunectar, SunnyDew and other products undergoes a unique purifying and concentration process that enhances stevia's benefits. Understanding the importance of stevia, we successfully petitioned the FDA (Food & Drug Administration) in 1995 to lift the import alert on the extract of stevia leaves, allowing us and other companies to use stevia as a dietary supplement and dietary ingredient. In recent years, Coca-Cola and agricultural products company Cargill teamed up to market a new calorie-free natural sweetener tentatively called Rebiana, as a sugar replacement in a number of food, beverage and supplement products. However, the two companies acknowledge that they face regulatory challenges, since the FDA only allows stevia to be sold as a dietary spplement and not as a sweetener. Whether or not the FDA will ever allow stevia to be marketed as anything more than a dietary supplement remains to be seen. Regardless of the FDA's decision, Sunrider will continue to formulate, manufacture and market products with superior quality stevia for the enjoyment of all our consumers around the world. White sugar is so altered from its original plant form that it is actually a drug. Sugar and sweets can be as addictive as cigarettes, drugs, or alcohol. Sugar can be as difficult to give up as these health-damaging addictions. Physiologically, sugar and sweets excite the same circuits in your brain that are stimulated by pleasure-inducing drugs, giving you a mild and short-lived high. The immune system is immobilized and the body pulls nutrients to digest sugar, placing a heavy burden on the pancreas, liver, and entire body. It creates physical, mental and emotional problems. 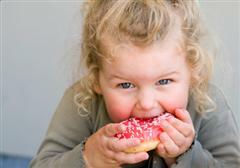 The average North American consumes 153 pounds of sugar per year. One can of soda pop contains approximately 10 teaspoons of sugar. Six teaspoons of sugar lowers the immune system 25% for 12 hours. Sugar causes the pancreas to malfunction, leading to hypoglycemia, diabetes, and mood swings. Artificial sweeteners are as dangerous as sugar. Did you know that even tobacco leaves are soaked in sugar? There you have a double addiction. Also, what is in most alcoholic beverages? Sugar! There is a solution, which in fact has been around for hundreds of years. The wonderful solution is the herb Stevia Rebaudiana. Diana Walker will be your Nutrition and Sunrider Coach. I also provide free samples of the Sunrider Fortune Delight and the Sunrider Calli Tea for new Customers. (in Canada it is under Skin care products - ask Diana at 1-800-840-0014 if you need assistance with opening your account or shopping online).